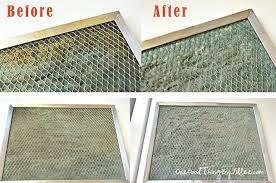 In this article today I am going to show you how to clean a greasy range hood and range hood filter. This is a terrible job, it absolutely stinks having to do it. But I am going to show you a quick and easy way to accomplish it with remarkable results. So let’s get to it. I really think you are going to like this video. Here is my greasy range hood. Yuck! Pretty disgusting, right? It’s just caked full of grease. And here is the range hood filter. I just popped it out by pressing the spring release. And there is the greasy side of it. The product that I am using is called Super Clean. You can find it at a lot of well-known stores. What I like is it works fast and it’s biodegradable (thanks to my friend at Las Vegas Appliance Masters: http://lasvegasappliancemasters.com – for pointing me to this great product). Three things here though. Make sure that you pre-test it, you don’t allow it to dry, and you wipe off your surface with water. So again, here is the range hood filter. What I am going to do is put in a baking sheet and spritz off the surface using the Super Clean. It immediately started to work, but I let it sit for 5-7 minutes. And then I rinsed it off using a watering can just because my watering can was sitting there and I wanted to see if that would work, and sure enough, it did. And I didn’t even use a sponge to clean the rest of the filter, I just used my gloved hand, which you should always wear gloved when using any chemicals. And I soaked it some more in water. And there you go. Voila! Looks pretty amazing, right? Now, for the range hood, what I did is I stuck a paper towel down into the crevice because I am going to test using the Super Clean on the right side. So that’s what I did. I spritz it down, and all the excess Super Clean went down into that crevice and got collected by the paper towel. 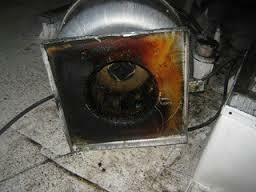 But you see, there’s so much grease on this range hood, but the Super Clean started working immediately. There is the right side that I treated. Here is the left side, pretty greasy still. So I wanted you to see the “before” , the greasy side, and then the “after” and how well the Super Clean works. So what I did was I sprayed some additional Super Clean on a towel and wiped off the bottom of the range hood. Just look how much grease is there. Then I rinsed it off and got it streak free by using a wet paper towel, a damp paper towel. Pretty awesome stuff! Well, I thought the results were amazing.The coolest part is it took less than ten minutes. So if you like this video, or maybe if you have your own tips, add them to the comments section, because that way other people will learn from your awesome ideas. If you like this video, go ahead and click the thumbs up button so that other people can see it and also, remember, you can subscribe to my channel and you will get a new DIY video every Friday.